The best way to ensure that you have a healthy, productive garden is to provide your plants with rich, fertile soil. Soil in most residential landscapes is neglected and over time becomes depleted of nutrients. Replenish the soil by working organic matter into it every year. Restore and maintain the soil so that it provides the essential air, water, and nutrients your plants require to thrive. The depth of the topsoil in your garden, the depth of roots and penetration resistance roots encounter are all indicators of soil health. - Avoid compaction. Many gardeners, anxious to get into their gardens in early spring, work their soil when it is still too wet. The soil should not be dug until it is sufficiently dry enough to crumble when worked and has reached a temperature of 50 degrees. Soils high in clay content are easily damaged if worked when wet. Foot traffic and heavy equipment crush the soil's pores, which limits plant's roots access to nutrients, air and water. Most gardens in Marin are primarily composed of clay soil. Clay soil retains nutrients but, because of its fine particles, has less pore space so the soil can become compacted. Plants become dwarfed and starved for nutrients, water and air. - Amend the soil with moderate amounts of compost. For soil that is primarily clay or sand, or is compacted, incorporate 2 to 3 inches of organic matter into the upper several inches and top dress with 2 to 3 inches of mulch every year. 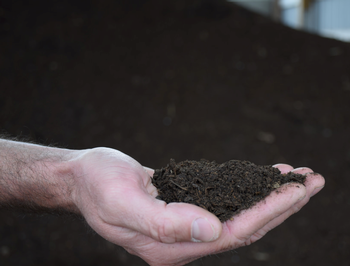 Organic matter is any material originating from living material that has died and decayed, such as peat moss, manure, crop residues, compost or cover crops. Any organic material that is applied to the surface and incorporated into the soil is called a soil amendment. If organic matter is added to clay soils, the soil becomes easier to work and lets roots and water soak in more readily. Mulching is the application of organic or inorganic matter (such as stone or polyethylene black plastic) solely to the soil surface. Avoid putting mulch right up against the trunks of trees or shrubs. When soil doesn't drain well, roots are deprived of oxygen. Healthy soil depends on a robust population of microbes and earthworms to recycle nutrients and maintain pore spaces in the soil to let in air and moisture. Adding compost limits compaction in clay soils, helps soil control temperature, promotes the growth of microorganisms, and releases small amounts of nitrogen and other nutrients through continued decay. In addition, organic matter provides the glues that lead to good structure, good drainage and good tilth. Instead of feeding plants, feed the soil by adding organic materials such as compost and mulch. As organic matter continually decomposes and disappears, soil building must be a continuing process in the garden. Compost can be made at home from yard waste and kitchen scraps (no meat), or purchased in bags from your local nursery or garden supply store. As compost or other organic matter decomposes with the help of the soil microbes, it releases inorganic nutrients that can be used by growing plants. Raised beds or terraces are good solutions for improving extremely poor or shallow soil, or soil with poor drainage. Be sure to follow recommendations regarding the amount to apply to your situation because use of too much organic matter can be detrimental. A good rule of thumb when incorporating compost as a soil amendment is 25 percent of the planned depth, i.e., 2 inches of organic matter worked in to a depth of 8 inches. - Amend the soil with manure. Dried animal manure supplies nutrients to plants and microorganisms and helps to aerate the soil. Any garden supply store will stock various manure types with application rates posted on the bag. Fresh cattle manure should be applied in fall or winter. Work the manure in right after spreading as this helps decompose the manure and lessen odors. Compost can be spread and incorporated like animal manure. - Use cover crops. A cover crop is a temporary planting, usually put in during the fall, which adds organic matter and protects the soil from wind and water erosion. Cover crops consist of fast-growing plants that are grown from seed during fallow times in a vegetable garden. After clearing the garden of a harvested crop, sow the cover crop seeds. When the soil warms up in the spring, work the resulting crop into the soil as deeply as possible, two to three weeks before planting the next batch of edible crops. Decomposed cover crop materials provide nutrients directly into the soil, thereby increasing biological activity, water filtration and soil tilth. Legumes such as fava beans, soy beans, crimson clover, red clover and hairy vetch are particularly valuable to Marin growers because they add nitrogen to the soil. Roots improve the tilth more than the tops of plants. Fine grasses and clover roots work on the upper 6 to 12 inches; alfalfa and sweet clover have taproots that extend deeper. When they die and rot, the roots leave channels for water and air movement in the soil. - Top dress with mulch. Once your plants are established and warm weather begins, top dress the soil with mulch. Mulching reduces moisture evaporation, suppresses weeds, moderates soil temperature and helps prevent soil compaction. In addition, mulches decompose slowly thereby adding organic matter over a longer period, providing an excellent way to continually add organic matter. Use bark in perennial beds if possible, since it decomposes more slowly. Grass clippings (that are free of herbicides) are an excellent material for veggie gardens. - Control weeds. Weeds crowd plants, compete for nutrients and moisture and often harbor pests. Hoeing, hand pulling, rototilling and mowing are effective mechanical means to get rid of weeds. The health of your soil determines the health of your plants. The mantra of Master Gardeners - "compost, compost, compost, mulch, mulch, mulch" - still rings true. The best way to amend the soil's structure and to provide oxygen, moisture and nutrients is to add moderate amounts of compost or a cover crop, and top dress with mulch. Begin by testing your soil for pH and nutrient content. Follow these recommendations and with time, your garden soil and the plants you grow will reward you with beauty and bounty.